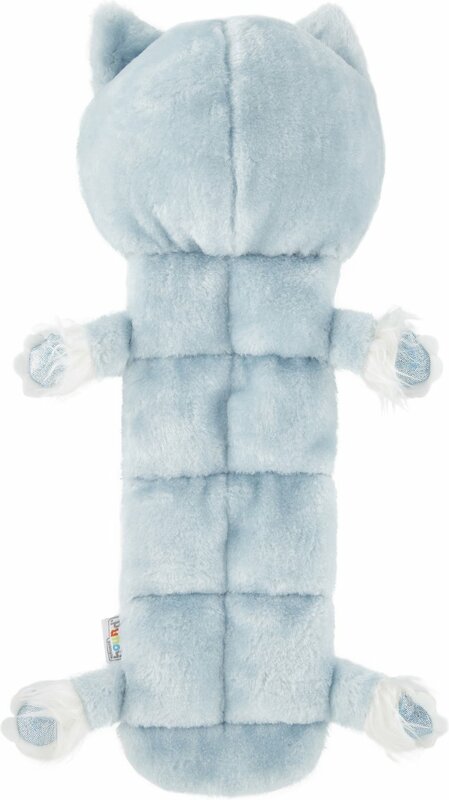 Make playtime even more exciting with the Outward Hound Squeaker Matz Abominable Snowman Dog Toy. 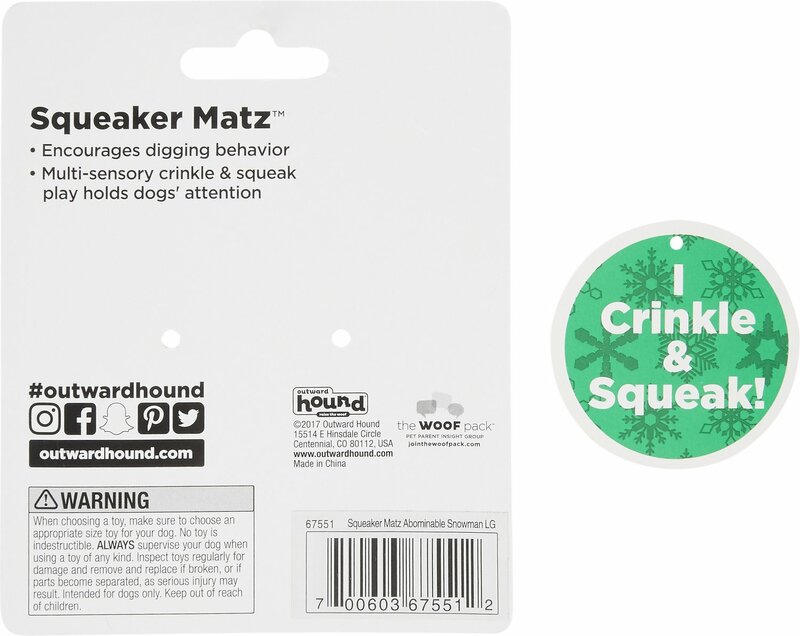 It’s like bubble wrap for dogs, featuring multiple rows of squeakers for the loud squeak-tastic fun your pal loves. To keep your energetic pal engaged, it’s long and mat-like so it has a natural shake and flap factor to keep the fun going. And during quiet times, it even doubles as a soft, plush security blanket. Since it’s ultra-lightweight, you can toss it effortlessly so it’s great for playing fetch with your energetic pup, whether at home, at the park, or your favorite spot, and makes for an engaging, rewarding activity you can enjoy together. Features 16 squeakers in multiple rows for the squeak-tastic fun your pal loves. Long and mat-like so it has a natural shake and flap factor to keep the fun going. Can double as a soft, plush security blanket for your pal during quiet times. Ultra-lightweight design so you can toss it for games of fetch indoors or outdoors. Perfect as a unique holiday present that any dog lover will simply adore. I bought this toy for my two Siberian Huskies on sale (about half off) after christmas and boy was that 7 dollars worth it! It has a growler in the head which my pups hadn't had before and they just about died! lol the growler in the head only lasted about 10 minutes before all the stuffing & growler was removed... but the rest of the body seems pretty durable and they have had it all day and it is still in tact... and my dogs had so much fun playing with it that it was worth it... I am not sure I would spend 15 dollars... but if you have high prey drive dogs and catch this toy on sale... grab a few of them! Our small dog goes crazy with this thing, chasing it around the house, shaking and squeaking. It only takes a week to tear the nose off and rip it open. I have a 95 Golden Labrador Retriever and she Loves to chew on her Big Rawhide Bones or Kong's. But when it comes to her Squeaky Toys or her Stuffed Fuzzy Babies she LOVE, LOVE, LOVES THEM. She will even take them with her when she goes outside and brings them back and they are totally hers. I actually believe how long they last or how they are treated depends on the Temperment of the dog and NOT the SIZE OF DOG or the quality of a Great Quality Toy that can last for years. My English Springer loves his snowman! He carries it around all of the time and must have it in his crate when I'm not home. I was disapointed to find that the body of this toy only had 2 squeakers in it, not 8 like advertised. The squeaker in the head did not work. My dog still absolutely loved the toy and quickly ripped the squeaker out of the head. Our Scottish Terrier was able to tear all 4 legs off with in 4 hours :( Poorly made. Just got it so will see how it is received. Cute toy but my two German shepherds ruined the squeakers in probably 10 minutes. Probably would be fine for small dogs.